At some point in the snow-heavy winter of 2011, I had an idea. 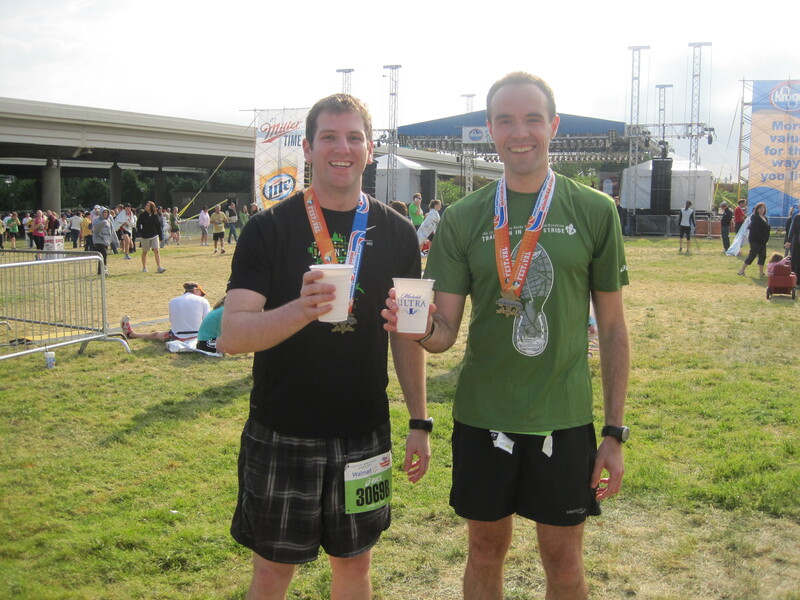 Why don’t I run two half marathons in one weekend? 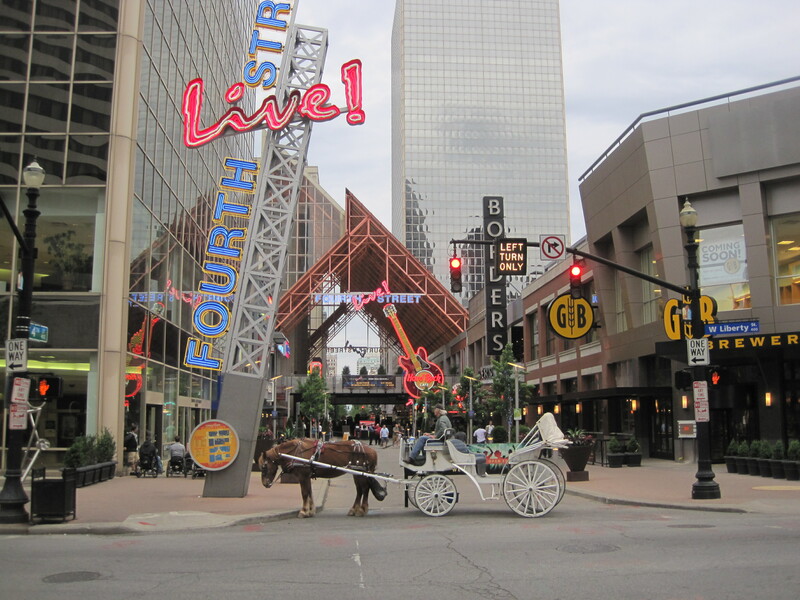 I could drive down to Louisville and run the Kentucky Derby Festival miniMarathon on Saturday, and then drive 90 minutes to Cincinnati for the Flying Pig on Sunday. I’d knock out two states at once and save myself some money in the long run. But more importantly, it would be a great achievement and though I wouldn’t cross the finish with fast times, I’d have bragging rights for a while. 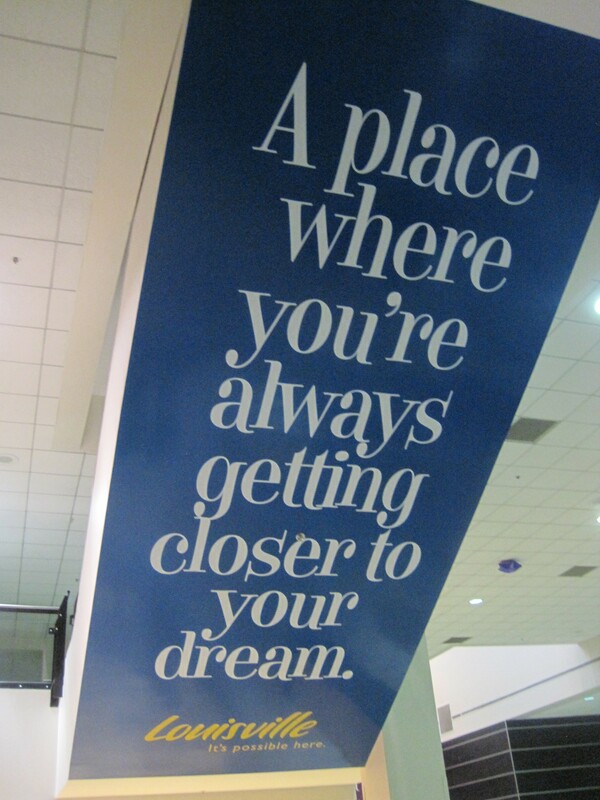 If the dream is to run the fifty states, then yes, Louisville, you tell a great truth. “Don’t do it,” a co-worker with a 2:57 marathon PR said to me when I giddily told him this plan. “Don’t do it,” he said again with a solemn and sagacious expression. With a slow shake of his head, he repeated the cautionary mantra, pausing the broken record routine to tell me it’s hell on the body. Under normal circumstances, I would take this as a challenge – who cares what others think, I’m doing it anyway! But the Bayshore Marathon would be just four weeks after this crazy idea, and I had already decided that was the most important race of the season. 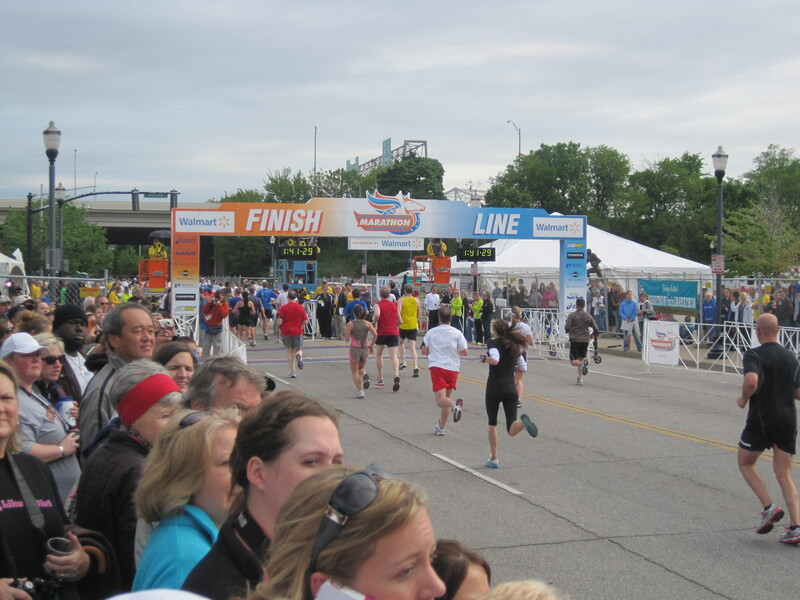 So I chose to run just the Flying Pig Half Marathon and ended up feeling great about the decision. Not only did I get to bring along three friends on the trip, but I ran a PR in both Cincinnati and Traverse City four weeks later. 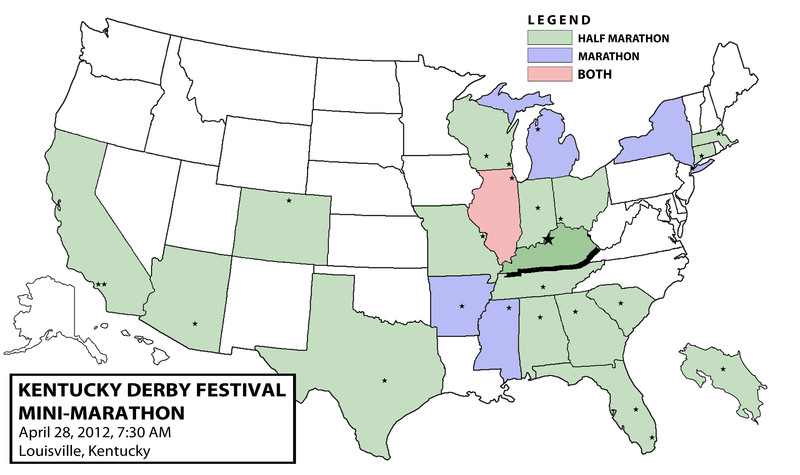 However, by opting out of the Derby, I had automatically slated it for 2012, which brings us to this weekend’s race. As many of you might know, I love reading about fellow runners’ adventures. I have a decent list of running blogs that I follow on a regular basis and I like to chime in now and then with my two cents. On occasion, there will be some blogger overlap, but usually I find this out post-race, so the opportunity to meet new people face-to-face is gone. 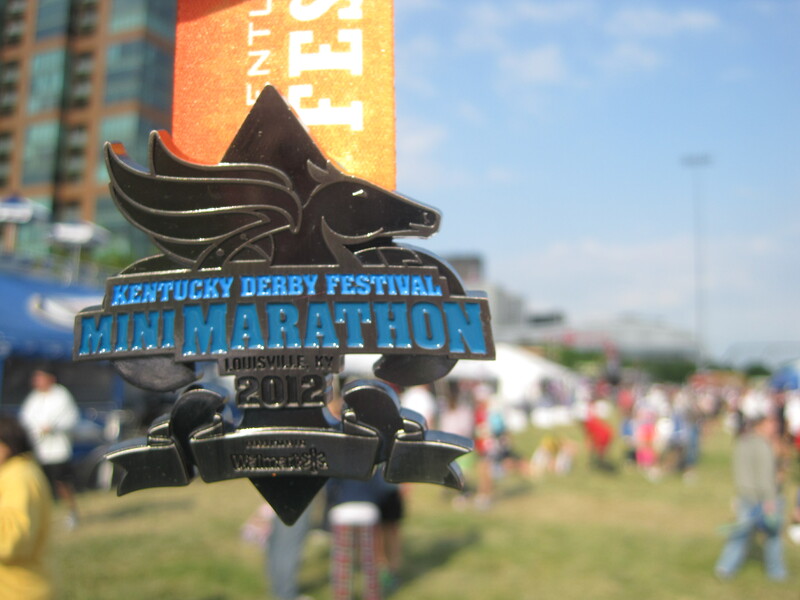 However, this time, I knew ahead of time that three different fellow bloggers (five if you include Otter and myself) would be making their way to Louisville for the 11th annual Derby Marathon and miniMarathon. There was Jeff, a Chicago road runner turned ultramarathon fanatic; Glenn, the local who would run his first half marathon; Aurora, who set out this year to run a half marathon every weekend; Otter, my trusty running hetero-lifemate, and lastly, me. When you only have a night and some frenetic moments before and after a race to meet up, logistics can get complicated. 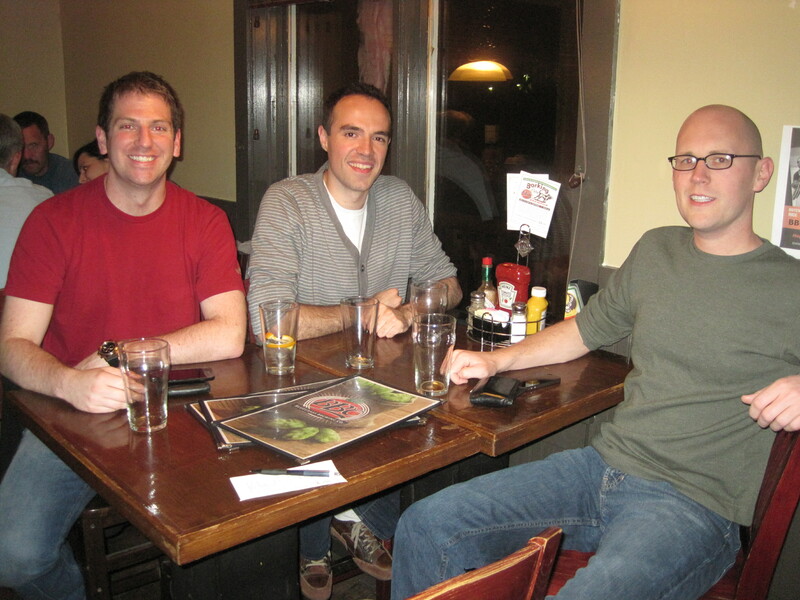 Fortunately, I was able to get together with Glenn Friday night at the Bluegrass Brewing Company for an APA. I was pretty surprised that he agreed to get beers with us ten hours before his first half marathon. I feel like I was on nutritional lockdown the week leading up to mine. After he dropped some local knowledge on us, it was time to get some shut-eye. We were up at 5 AM, skies troubled and winds cutting across the parking lot of the Jameson Inn, where we were staying. The chance of rain had been fluctuating between 30% and 70% over the past few days and we (Glenn included) were expecting the worst. Only twice have I run in rain, both times it was practically inconsequential. With the amount of races I run, my lucky streak was bound to end, most likely in the shape of a date with torrential downpour. But as we arrived at the start between the Yum! Center and Louisville Slugger Field, the rainclouds looked to be heading elsewhere. Finding parking near the start was amazingly easy at 6 AM and we managed to snag a spot a block away from both the start and finish lines. Right before the race was to begin, we met up with Jeff by the Pee Wee Reese statue outside the Louisville Sluggers stadium. He was in Louisville from Chicago to run the full marathon as a training run, a lead-up to the Ice Age Trail 50-Miler in Wisconsin just two weeks down the line. We wished him luck and made our way to the start. We weren’t able to see Aurora, but wished her well in spirit. 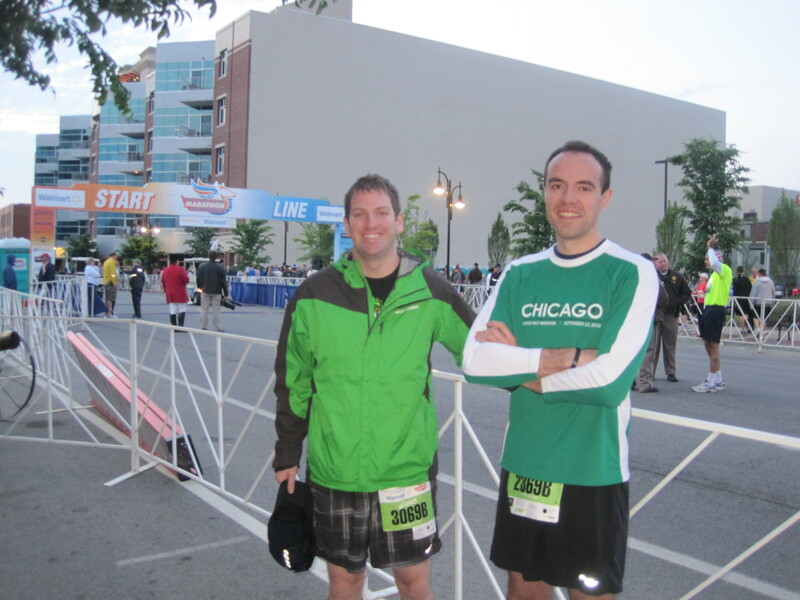 Me with Jeff just before he went on a 26.2-mile training run. “What time are you guys aiming for?” Glenn asked the night before. Always a good question. I try to run every race as well as I can, hoping to leave it all on the finish line. But with the Indy 500 Mini-Marathon the next weekend, I wasn’t sure if going hard was the right thing to do. But to answer his question, I told him that if the weather was ideal, I’d try and kill it. I have a well-documented history of sandbagging and publicly setting up low expectations for myself, but if we get a cool day with little wind, I will always do everything possible to run a fast time. Minutes before starting, we were in our corral, with the course spread out before us, blue skies and a calm breeze nudging us from the east. The rain had avoided the city, meaning that the completely flat course was now accompanied by perfect conditions. It was time to make it happen. 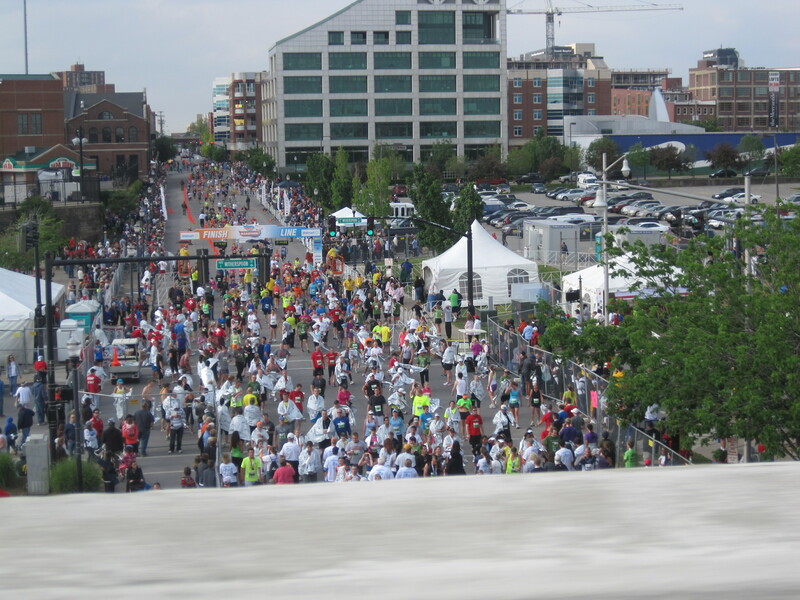 The first four miles of the course were run through the wide streets of downtown Louisville. Like all big races, I spent the first ten minutes cutting sharp turns around slower runners. But even with the mandatory sidestepping, I was fast and unapologetic. The first mile down Main Street was a 7:14, just a few seconds shy of my PR pace. My last two half marathons have imbued me with a confidence that will catch up with me one day, but in the words of Aragorn, today was not that day. At the risk of sounding too pompous, I’m calling it my Wanjiru breakthrough. The late Sammy Wanjiru took the marathon by storm in the 2008 Beijing Olympics, defying the rules and proving that you can surge hard from the start without dying at the end. Since then, Kenyans have uncontestedly assaulted all major marathons with reckless abandon. It’s as if they all saw what was possible and downloaded Wanjiru’s tactics into their brains. This is what was happening to me, except on a much slower scale, as I rounded mile 3 in 6:59. Though the sight of a 6 in the minutes position of my pace still made me a little nervous this early in the race, it was no longer a siren warning me of impending doom. I felt good at this pace … but as I approached the 7:14 pace group, I thought it wouldn’t hurt to stick with them for a few miles to keep my ambitions in check. That lasted for two thirds of a mile. When the course turned south on Broadway and onto 4th Street, I took off, hoping I wouldn’t see those guys again. The course very quickly changed from drab urban grays to more scenic greens. At mile 5.5 we wrapped around Central Park, where all memories of running through wide city streets were erased. A large group of spectators had gathered at the end of this wraparound, just before the 10k mark. My watch told me I was four seconds under PR pace, with a little over halfway to go. The big question now was, would I be able to keep it up? That task would be made easier by the miniMarathon’s course. Glenn hadn’t lied to us when he said it would be amazingly flat. It wouldn’t be until mile 8, where we entered the famous Churchill Downs, home of the Kentucky Derby horserace, that we would slide down, under the racetrack and back up into the concourse, briefly testing our climbing abilities for the first time. I was pleasantly surprised when I wasn’t kicked in the nose by the smell of horse droppings. Once inside the renowned and historical site, I began to run faster. Part of it was the desire to negative split. Another part stemmed from the sheer enormity of the venue, which put an extra kick in my stride. But the biggest reason had to do with the 11-year old girl that was passing me. I knew her exact age because her dad was running with her and everyone around them was fawning over how much of a badass she was. I concurred. But I wasn’t going to let an 11-year old girl beat me, so it was time to turn on the afterburners. Later that day, Otter would ask me if I had seen the horses like a kid leaving the theater after seeing Star Wars for the first time. I had more important matters at hand. I cruised out of the Churchill Downs at a 6:52, shooting out of a dark tunnel and north onto 3rd Street, where we would run back to the finish line in a 3-mile straight line. The beautification of the course would now be slowly undone as we ran from tree-heavy neighborhoods back into the heart of the city. Because there were only two more turns in the race, it was very easy to get in a zone, focusing on nearby competitors and casting a line to reel them in. The sun was out but temperatures were standing still at 55. Thanks to all the trees, the road to the finish was covered in shade and there would be no mid-morning heat wave or fashionably late rainstorm to slow me down. It was around then, just before mile 10 that I began to consciously ask myself: what can possibly stop me? The last three miles were all run under 7 minutes and I wasn’t feeling signs of fatigue from my legs or lungs. Some people might say that I was taunting the universe, presenting it with a potential teaching moment, the impudent youth biting off more than he can chew. But I was being both bullheaded and completely honest when I considered it: what can go wrong in the next three miles to stop me from running the fastest race of my life? Though the options were many, and I could produce a good list right now, nothing occurred to me at the time. So I kept it up, running mile 11 in 6:49. Quality. Bonus points for minimizing the Walmart sponsorship. It was at that point that I realized my rivalries with 11-year olds weren’t over. There were two young kids, easily under 13, running side by side ahead of me as we entered downtown Louisville for the last few miles. These future Dathan Ritzenheims were also completely dry, because apparently you don’t sweat when you’re a middle school running prodigy. I quietly wished them a rewarding athletic career, one in which running makes you cool in school, and left them to eat my dust. As I reached mile 12 in 6:54, I took my first look at my overall time. The clock read 1:24 and change. And “or” is what happened. I started turning my feet over more quickly, practically springing off my toes with every step. I had been trailing several runners for miles and it was time to put them behind me. A guy with a white shirt that said “BEEF” on the back; another runner dressed in mostly pink with a shirt that said “Big or Small, We Save ‘Em All” (presumably running with a breast cancer charity); a female runner with a “Train Hard, Breathe Easy” shirt — all of them became targets. One by one, I passed them all and never looked back. Some were, in fact, breathing easy. Others looked like they wanted the race to have ended miles ago. I could see the right turn ahead onto Main Street, knowing that I was within striking distance of the finish line. I reached mile 13 in 6:16, my fastest half marathon mile ever and by a huge margin. The last 0.1 had a slight but delightful downgrade, which made it easy to begin a sprint. I was happy, as I always am when I surpass my time goals. But it wasn’t until I saw the clock that I actually felt a little short of breath. I saw it and did something I haven’t done in the final moments of a race: I laughed. In a state where I need every last rush of air to push me forwards, I was actually laughing. I don’t remember if they said my name or if music was playing because I was in another world as I crossed the finish line, my arms shooting up above me like fireworks. I finished in 1:30:47, a time that I would have considered impossible the night before. Not only was it a PR by over three minutes, but it was faster than my all-downhill Tucson Half Marathon, which up until that morning, was the equivalent of playing video games with cheat codes or bowling with bumpers. But best of all, it forever buried my fear of the 7-minute pace. The last seven miles of the race were all under 7 and I felt like dancing. 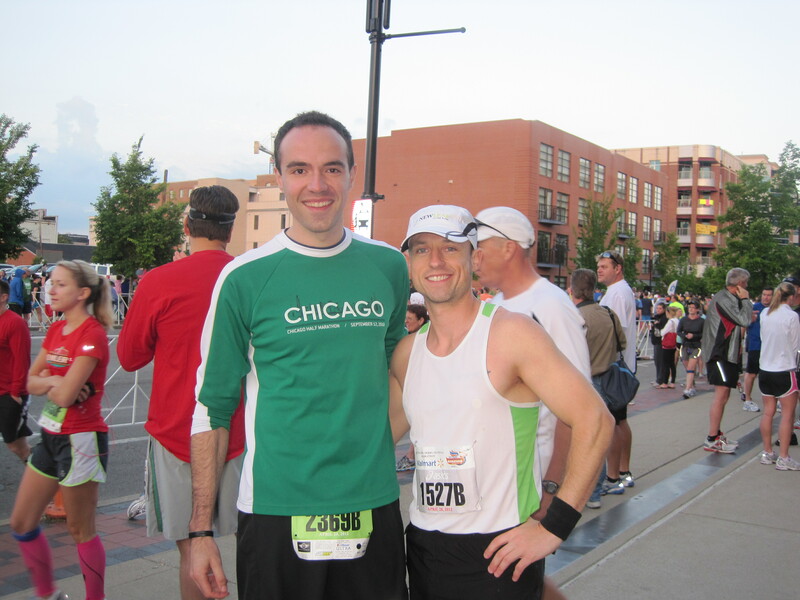 Because of this, the race was more than just my 21st state – it was a genuine game changer. With my colorful medal beating proudly against my chest, I went to hoard some post-race snacks. The organizers really went all-out, providing fruits, bagels, granola bars and even Sun Chips. I took a few and ran to the car to get my camera. Back at the finish line, I managed to get some quality shots of Otter obliterating his PR by an even bigger margin than me. 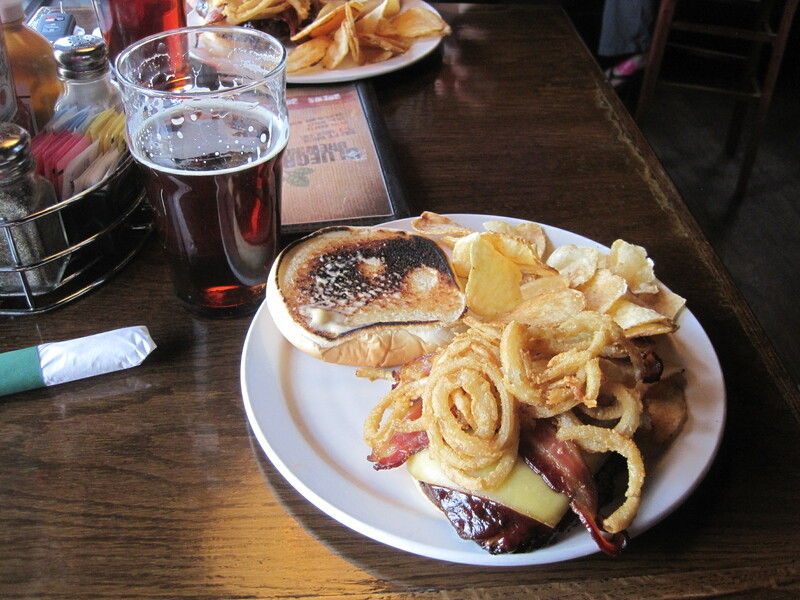 The rest of the day was spent eating delicious burgers at the Bluegrass Brewing Company, driving back to Chicago and reminiscing over our accomplishments. All in all we loved the race – our only complaint, if we had to name one, was that not all water stations had Powerade. It sounds petty, but if we had been running the full marathon, I’d be more than a little miffed. Then again, if that’s my only criticism about a race that has to cater to almost 18,000 runners, then someone’s doing something right. And so I notch one more Southern state onto my racing belt. The region has been very kind to me, not just in providing me with quality, well-run races, but allowing me to scorch their courses to fast times. As summer approaches, my opportunities for such performances diminish, so I’ll enjoy these glorious mad dashes while I still can. For other perspectives and completely different stories about this race, check out the following blogs over the next few days: Otter‘s, Glenn‘s, Jeff‘s and Aurora‘s. Congratulations again on obliterating your PR. I checked your results, and you finished in the top 1.78% of runners. That’s just crazy to me. You were trying to overtake youngsters, and I was just trying to pass grandmas! DUDE! I am SO happy for you! Not just because of the PR, but because you DESTROYED your previous best. Leaps and bounds, Dan. Your hard work is paying off and I feel good knowing I got to meet you on your special day!!! Congrats on the massive PR! That’s an awesome time! And negative splits too. Sounds like a perfect race! I feel the same way about kids (and people who wear Vibrams). I try and pass as many of them as possible! Congratulations on a really awesome race and ANOTHER PR! Congratulations on the new PR! Fantastic. Sky is the limit. Keep running. Great job! Found your blog on the DerbyFestival facebook page. Great recap and congrats on a monster PR! I’m running a marathon in every state before I turn 30 – look for my post in the next day or two! I do remember you turning on the burners at Disneyland. I can’t believe they had Sun Chips and you went to get your camera. Big mistake that will define this race. Good read, Dan. We ran the Derby mini this year. I wish I could say the aroma of horse and tunnels of Churchill had treated me similarly. I didn’t properly fuel. As I reached Churchill and prepared to turn on the burners the middle school kids were putting me to shame.